It's Pep Rally week and we are here today to share a sampling of the NEW Paper Smooches JULY release with you! TWO newstamps and TEN new dies will be available to purchase on June 30th at 8:00pm pacific time. Once our release goes live, you will find our new products HERE. Deadline: You have until midnight PT on Sunday, June 28th to leave a comment. Please check the Paper Smooches blog on Monday, June 29th to see if you are one of the FOUR lucky winners. A couple of our designers are taking a small hiatus to care for different things in their life. Amy Kolling is filling in for Emily and Melissa Phillips is filling in for Pamela. We are so excited to have them join us in July! For my card, I used the dies to make a background and just used color on one flower. This is a fun way to use a very intricate die. Even though the die is very detailed, the white on white design still keeps it clean. I blended inks on the one flower and then added the bold sentiment strip. The black of the sentiment strip is pretty dark, so I balanced the black with some enamel dots. Couldn't have been easier. Thanks for hopping with us today! The next stop on the hop is the wonderful Kalyn Kepner! Have a great day guys! Another new way to use dies! This is so pretty. So pretty spotlighting that one flower. Still clean looking with oh so much great texture. Just lovely! Reminds me of the spotlight technique in a new, fun way. I am loving this card. Just so simple but effective. Love the use of white space on your card - Beautiful! I love inlaid cards and this was so clever to color one flower. Absolutely beautiful!! I love how you used the die for the background!!! Love this! I love how you used the dies to create your background and made only one a focal point. Your suggestions of other ways to use these dies are awesome! Very, very pretty. I have to try that technique with the dies. Gorgeous! Aaaa! I must have these dies. Love your card. What a great look using the flower die for a background and just coloring one for a real pop! Love the look! I love what you did with the dies to create a background! Beautiful card! Love the simplicity of it with just a pop of color. Great background with the dies. I love how you chose to color only one flower in. You rocked it!! Love it! Great idea for using these dies! The pop of color on one flower was perfect, love the card! Clean and simple, love it! So pretty. I love the idea of spotlighting the die cut. Thanks for the inspiration! Love the dainty flower dies and your card is wonderful! Fabulous idea..thanks for that..I must try something like this.Thanks PS for the great Blog Hop and prize. This is a great card. Nice technique. Beautiful design and a great way to use dies. LOVE IT! I love the card - the technique so so cool and fun and the possibilities are endless. Thank you for sharing! Love this style and using the die in such a creative way!! I'm inspired! Love the use of dies to create the background! Especially effective with just one flower coloured! I love the look of white-on-white with the one flower colored in...so striking and so effective! How pretty! I love the selective coloring of the flower on this card!! Beautiful! I absolutely love this die! What a great idea to use the floral die as a background design, JJ. Dainty Flowers is such a sweet die! This inlaid die idea is wonderful with the paper piecing. This is a pretty new die and I like the tonal look. So pretty, love your CAS idea! Beautiful--love the inlaid look on the colored flower. Clean and simple but lovely. Love the inlaid technique. Thanks. Posted on my FaceBook page about Paper Smooches blog hop with link for them to click on. with a link so others can join in - have a blessed day! I love doing inlay die cutting -it's such a fun technique!!! Your card is beautiful!! Love this look of white die cuts on a white base. I shared on FB about this hop and release. 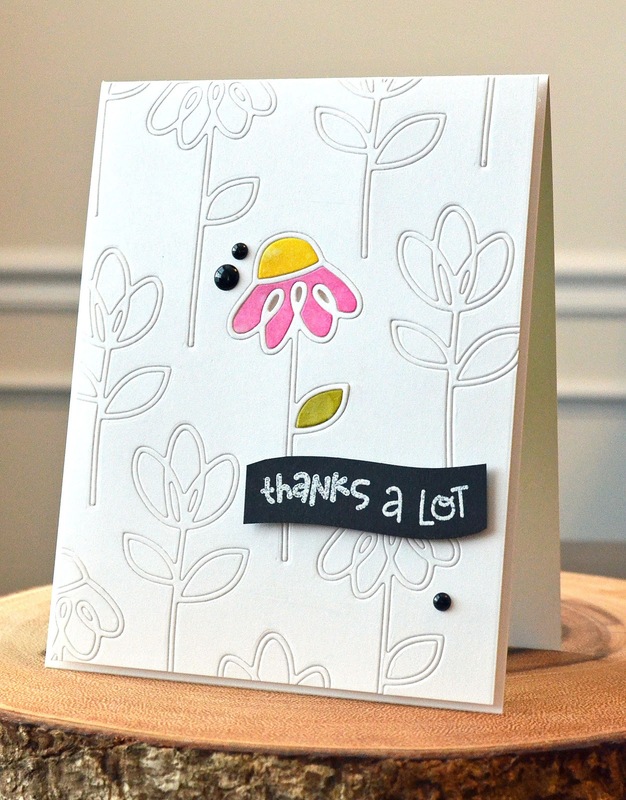 Love this pretty flower die and how you used it on your card! Nice card! I love the colored inlay which you did to make your wishes PoP right off the card with importance! Lovely C & S design work!!! I like it! That die is lovely the way you used it. Oh my goodness...what a clever design, JJ! I LOVE this card to pieces!!! It's amazing to me how a repeating image with a POP of color can be so appealing. Great card. Awesome card! I have this stamp set and now I'll need the dies. Love what you've done with them. Beautiful card that so a lot of thought- one beautiful pink folower! Fun new dies and I love the pop of color. Oh what a great design, JJ! Love these new dies - can't wait to see this set revealed! Love this pretty CAS style! It reminds me of a sweet little doodle! Very fun! Lovely card! That single flower is perfect. The inlay die cuts are very cool. Love the inlaid die cuts with the one pop of colour! This is so dang cute. I love it. OOOHH...LOVE this effect with inlaid dies and your pop of color! What a wonderful idea - I love the way your card looks! Oh my! I can't wait to try this technique and for the whole reveal! Thanks for sharing! E what a neat and different card! ! I love it! This is so very nice. I really like it.. Thank you for sharing. The flower with the inlay pops perfectly on your oh-so-stunning card. Oh I've always loved the inlaid die cut technique and yours is perfection! I posted about the hop on Facebook. Very effective card. Love the texture and background interest you created using the inlaid method and the single colored flower looks wonderful against the white. I think you were right about the black dots - really a nice finishing touch. Love this so much and can't wait to get my hands on this die set!! What a beautiful card, its made a wonderful background ! LOVE your ELEGANT inlaid design with the POP of colour!!! Love the inlaid die cut look. Wow.... an amazing card! Can't wait to see more from PS on the 30th! Oooh love that inlaid die cut with that pop of color! So cool! What a beautiful and clever card JJ! I love the all white with that little pop of color! The pop of color looks stunning against the gorgeous white background! Beautiful! Love how you used the die in a unique way to showcase it. Beautiful and a very clever way to use those dies. I love it. I loooove the detail of that awesome die and to create a background is so cool! Wonderful card and great technique. I love the design of this card, its a technique I'm definitely going to try. What a gorgeous & creative card! The open loop flower is so pretty. Inlaid die cuts!!!! I love your classy card! Love your card! So clean and pretty! Oh so pretty! What a clever way to use these dies!!! Love the use of the die to fill in one of the flowers. Beautiful touch of color, I love it! OH. MY. GOODNESS. **gasp** THIS IS BEAUTIFUL - what a work of art on a card - love the white on white in laid dies and the pop of that center flower!!! SO AWESOME!!! Your card is absolutlely stunning! LOVE that flower die! Great card! Such a cool technique!!! Love this! Love this! I'm really excited about these new dies, love the tone on tone with just the one colored flower. I like PS on FB and shared there. I'd posted this card to my Pinterest "must do" list already and think it's a great technique I've not done yet; thanx for the inspiration and blog candy opp! I posted on my blog for an additional chance to win; thanx! I'd posted on facebook for an additional chance to win; thanx! This is stunning! Adore the design - so clever! Love this design, so striking!!! oooooooo! I just LUV that inlay design! so pretty!! This is gorgeous, JJ! I love the inlaid design and the balance you added with the color and the enamel dots. I love this card. I have never made an inlaid card before but I am definitely going to make this one. Love the "spotlight" of your one die, it really makes the card pop. Love how you highlighted the flower in color! I adore this card!!! I bought this die bcuz I was so inspired by this card!!! Soooo stinkin cute!!!! TFS!